Inside the largest living organism on Earth. It wasn’t too long ago, maybe 10 years, that I learned aspen grow as colonies, each tree an identical genetic clone of the others in its colony. You can see this in fall when the colors on many nearby trees change at the same time. As soon as I started poking around at the Utah map in preparation for our trip to Capitol Reef National Park a couple weeks ago, I knew we were going to have to make a stop at Pando, a 106 acre aspen colony that is the single largest living organism in the world, the heaviest, and likely the oldest at ~80,000 years! We had a great few mile hike through the forest. Very quiet, very peaceful, and so many aspens. 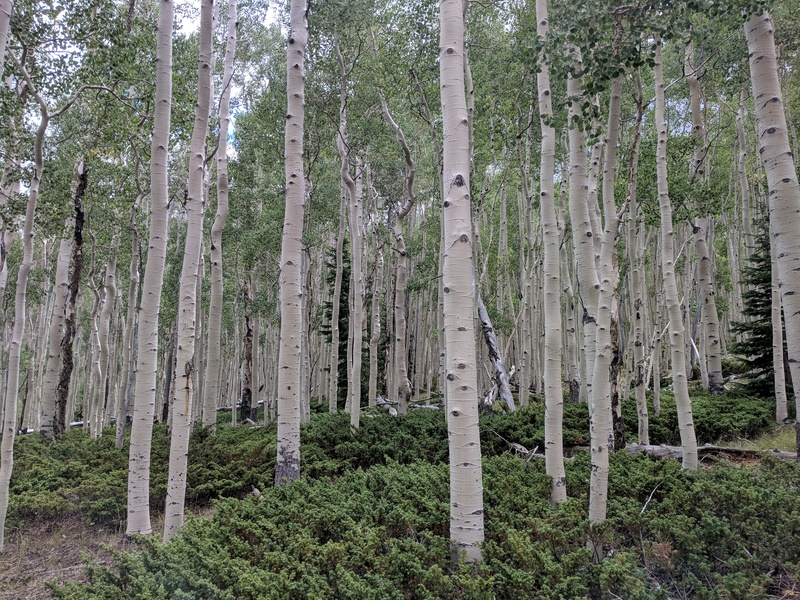 "Pando Forest, Utah" by Jeremy Felt, unless otherwise expressly stated, is licensed under a CC BY-SA 4.0 International License. Absolutely on our list of must sees! Whoa! We are adding this forest to our list of places to visit!